Developed and implemented by Resolve, an Imperial Logistics group company, this ground-breaking system is providing the retailer with real-time visibility across the delivery landscape, and is enabling effective management and decision making to ensure OTIF (on-time and in-full) deliveries to all customers, reveals Imperial Logistics chief strategy officer Cobus Rossouw. Expanding on Imperial Logistics’ service offering to this retail industry giant, he says: “Pick n Pay decided that the time was right to upgrade its online shopping system from a predominantly manual ‘pick-from-store’ model, where orders placed by online customers were routed to the closest store, to a centralised online delivery offering with regional warehouses specifically for online orders. This new process required a completely integrated delivery management solution; one that could utilise a range of different technologies to provide real-time visibility across the delivery landscape. Pick n Pay’s online shopping division needed to effectively manage, track and monitor the movement of deliveries between its warehouses, hubs and the customers’ delivery locations. It wanted a solution with the capability to send notifications to customers prior to delivery; to offer electronic proof of delivery (ePOD) functionality to allow for the capturing of delivery details and customer satisfaction surveys; and to offer visibility on the reverse logistics of bins returned to the warehouse. The One-Link Delivery Management Solution focuses on internal visibility and provides management visibility on drivers, vehicles and assets. The mobile application gives users access to numerous functions, including pre-trip vehicle inspections (with photographs of assets); electronic trip-sheet information; routing and tracking information; incident reports, to aid during accidents or breakdowns; electronic proof of delivery (ePOD), including a sign-on-screen and photographs of damaged items; and status updates on the delivery. It boasts user friendly interfaces and offers rugged tablets for use by delivery personnel, warehouse and hub managers. 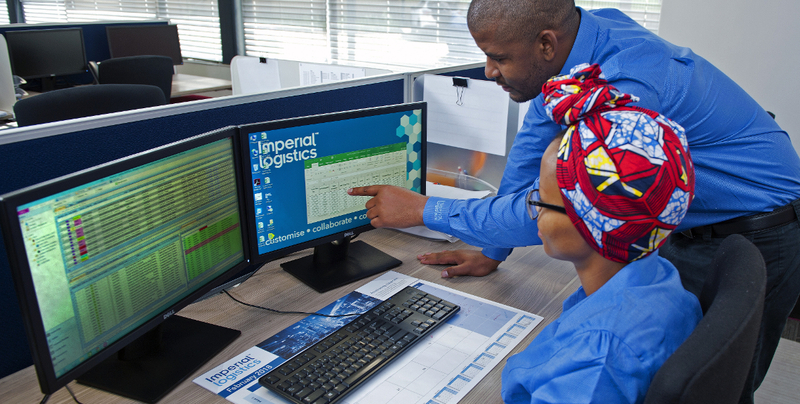 Outlining the outcome of this project, Rossouw says that Imperial Logistics’ unrivalled delivery management solution has helped Pick n Pay to increase customer satisfaction through correct deliveries of online orders and timely communication. “The introduction of new technology into the process – like RFID tags used for bulk loading, bin level tracking and mobile tablets used for workflow information and real-time reporting – has minimised the unnecessary manual processes that negatively impacted process time and data accuracy. An increase in OTIF deliveries has been achieved, while redeliveries and returns have been reduced, resulting in time and cost savings. There is less shrinkage of items and equipment due to improved tracking and visibility,” he concludes.